The private pilot was flying an experimental airplane at a low altitude along a river when the airplane struck a power line suspended 30 ft above the river, causing the airplane to cartwheel. 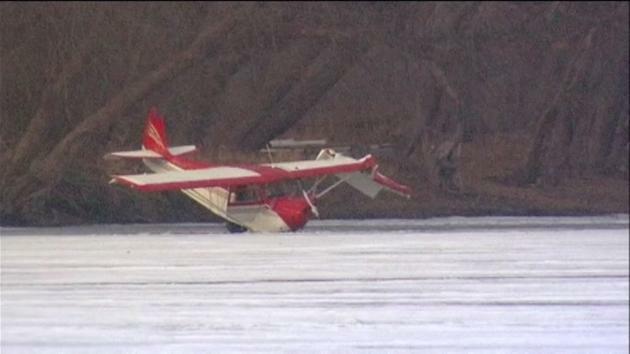 The power line wrapped around the airplane, and the airplane descended straight down, impacting the ice-covered river. A postaccident examination of the airplane showed that the fuselage forward of the instrument panel, the engine cowling, and the engine were bent upward about 30°. The forward fuel tank between the cabin and the engine had broken open, and the smell of fuel was apparent. The airplane's propeller showed indications that the engine was producing high power when the airplane struck the power line. Flight control continuity was confirmed. Examination of the engine and other airplane systems showed no preimpact anomalies. Thus, the accident likely occurred because the pilot did not see the power line suspended across the river while he was flying close to the river surface. The pilot's failure to see and avoid the power line. Contributing to the accident was the pilot's intentional flight at low altitude. 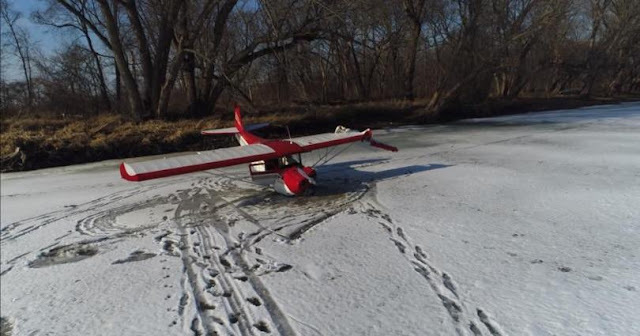 On January 20, 2018, about 1233 central standard time, a Matheny Christavia Mk1 homebuilt airplane, N746LM, struck a power line and impacted on an ice-covered river during low-altitude flight near Grand Detour, Illinois. The pilot and pilot-rated passenger were seriously injured, and the airplane was substantially damaged. The airplane was owned and operated by the pilot as a 14 Code of Federal Regulations Part 91 personal flight. Day visual meteorological conditions prevailed, and a flight plan had not been filed for the local flight, which had departed from the Poplar Grove Airport (C77), Poplar Grove, Illinois. Witnesses observed the airplane flying low over the Rock River between 1120 and the time of the accident. One witness who lived near Machesney Park, Illinois, saw the airplane flying 100 ft. above the river and within 400 to 500 ft. above houses. Another witness who lived along the back channel of the river near Grand Detour said the airplane went by her house so close that she could see the pilot in the airplane. She estimated the airplane was 15 ft. above the river. Moments later, the airplane struck a power line that ran from the river bank across to an island in the river. 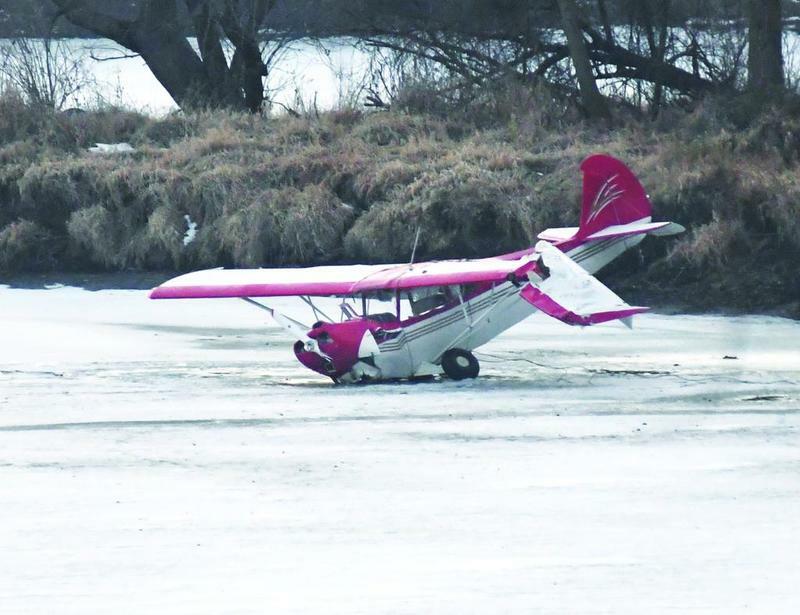 The airplane subsequently cartwheeled in the air wrapping the power line around it, and then dove straight down, impacting on the ice-covered river. An examination of the airplane showed a power line wire wrapped around the leading and trailing edges of both wings at the wing roots, and around the aft cabin. The left aft cabin window was broken inward and showed wire marks on the Plexiglas. The right main landing gear was broken inward and under the airplane's cabin. Wire marks were observed on the tire and gear strut. The front windscreen was broken out and fragmented, and the forward fuselage at the instrument panel, the engine cowling, and the engine were bent upward 30°. The forward fuel tank between the cabin and the engine was broken open and the smell of AVGAS was prevalent. The airplane's wood propeller was broken aft and splintered circumferentially. The outboard 5 ft. of the airplane's left wing was broken aft and downward. Wire marks were observed along the top wing skin starting at the fracture and running aft and outboard toward the wing tip and wing trailing edge. Flight control continuity was confirmed. An examination of the engine and other airplane systems showed no preimpact anomalies. According to Commonwealth Edison, the electricity provider to Grand Detour, the power line height above the river where the airplane came in contact with it was about 30 ft.
A NTSB Form 6120.1, Pilot/Operator Aircraft Accident/Incident Report form was sent to the pilot to complete. The pilot never returned the filled-out form, despite several attempts on the part of the NTSB and the Federal Aviation Administration to have him do so.